Blog FAQs: How can I eat Paleo without a gallbladder? FAQs: How can I eat Paleo without a gallbladder? My maternal grandmother, who many of you read about in my book, has no gallbladder. My father has no gallbladder. I’ve said it many times over, when I talk about my background and motivation to study and teach nutrition, that I live and eat in a way to do the best I can to prevent not only ailments like cancer and heart disease, but also the autoimmunity that apparently is an underlying root-cause of gallbladder disease. I feel strongly that I narrowly escaped a lot of serious health concerns by changing my diet when I did. And I feel very motivated to maintain the choices that I make day-in and day-out in order to keep my current health trajectory as it has been since I kicked grains, beans, and all processed/poor quality dairy from my diet. Earlier this year I wrote a post on How to Eat Bacon without a Gallbladder. By the response the post received, there’s evidently quite a few of us who have undergone a Cholecystectomy (gallbladder removal) or know someone with Cholelithiasis (gallbladder disease). There was a cry for more information, but since I’m not a nutritionist or medical professional, I didn’t feel qualified to speak further than what’s worked for me. Problem is, like most modern day diseases, the medical community just doesn’t get it. I appear to be one of the few voices in the paleo community who has this problem and can provide insight and recommendations – after having done a LOT of research. Among the misinformation the medical professionals may or may not realize they’re telling you, the above were the worst offenders for my overall health and wellness. Despite my doctors not believing I could possibly be eating a low-fat diet, I had been for years. And despite following an extremely low fat and whole grain filled diet, my disease progressed and stones worsened. I tell a detailed health history in my earlier post – but essentially, after 7 years as a vegetarian my body was wrecked. Was my low-fat diet making me fat and sick? During my twenties, my weight skyrocketed. Having always been overweight, I became morbidly obese and well over 300 pounds in my early twenties. I found myself tirelessly hungry and filled with intense cravings. I realize now that this was a symptom of micronutrient malabsorption. Since I wasn’t able to digest fat or fat soluble vitamins properly, my body wasn’t able to properly digest the foods I was eating. This led me to constantly want more food in a desperate attempt to get my body the proper nutrients it needed. This is a typical problem for those with Celiac Disease, which I now realize I have. Interestingly, gluten sensitivity is among one of the many undiagnosed causes of Cholelithiasis. Beyond a normal paleo diet, I’ve had to adapt my lifestyle and tailor my diet to meet the needs of my (now) very complicated body. After my extreme weight loss, the focus on overall health and well-being through diet and lifestyle has been the utmost priority for me. Before I discovered how, exactly, to eat and live I was a health disaster. I no longer have acid reflux, joint pain, headaches, elevated white blood cell count, terrible digestion or any symptoms for Syndrome X. Since my doctor never tried to figure out why my body was making these stones, I had never healed the root cause. The surgery, like a pill to be popped, simply masked the symptom – not healed the problem. Before I found paleo, my health continued to deteriorate for years after the surgery. Instead of discussing alternate diets that might help (like gluten-free), I had been told I needed to have surgery. I was also told it wouldn’t affect my long-term health and that digestion disruption would only happen short-term. The only truth I had been told was that it would be an “easy” laproscopic out-patient surgery. After the surgery, I no longer had intense (worse than child birth) painful gallbladder attacks. I’d say “Yipee!” except, instead I was left with the inability to control my bowel movements. Turns out a permanent state of IBS years after a Cholecystectomy is “normal”. It wasn’t until a few years later, when I discovered the paleo diet, that I’d remember what normal bowel movements felt like. Honestly, the freedom to eat in public without shame or fear of needing to immediately use the bathroom is one I try not to take for granted. Paleo gave me my health and life back with weightloss, but the resolved medical conditions are what I’m truly grateful for. I cannot do ketogenic diets. Occasional high-fat meals are fine, but since my body no longer is able to properly digest fat I need the carbohydrate and protein balance to help digestion be optimized. I find that around 75g of carbs a day helps me maintain weight, while preventing those IBS-like symptoms caused from my body’s inability to digest fat. I cannot intermittent fast. Since the gallbladder’s job is to store up bile and release it when needed, huge meals or meals after a long fasting period no longer provoke the release of extra bile. My body no longer has the “ammunition” needed to digest food properly. If an accidental fast happens, I find that grazing for a longer period of time works better as an introduction meal. I no longer drink a lot at meal times. Since drinking fluids dilutes the stomach acid my body does have, I limit my meal time drinks to just a small glass if needed. And when I do drink, I make sure I have no food in my mouth. This ensures I’m properly chewing my food. I take Ox Bile and HCL supplements with every meal, which mimic what my gallbladder used to do for me. It’s not quite the same as my own body would be, and since I’m not a doctor I won’t tell you what brands or how much, but these have made a huge difference. What I’ve noticed is less cravings when I take them, which means my body’s able to more easily absorb the nutrients I’m giving it with healthy nutrient-dense meals. I eat and drink gut healing foods. It’s not enough to try to do damage control on the front end. The more I do to help heal my gut of the food intolerance I had, which created the gallbladder disease, the better my digestion is. I find that kombucha in the morning is my favorite form of probiotics, since the insoluble fiber of raw vegetables can be difficult to digest. I also add organ meats to our meals where I can and make sure to have bone broth at least several times a week. Most importantly, I only eat fats my body can digest. This means that animal fats are from pastured animals, since grain-fed animals (and egg yolks) can trigger a reaction for me when I digest it. It also means I stick to the Balanced Bites ranking of common cooking fats. Since exclusively cooking with coconut oil, palm oil, palm shortening, lard, bacon grease, duck fat, tallow and butter – my digestive health has never been better! Learning the differences between oils and fats, why they’re different and how a person’s body responds to them at the Practical Paleo Seminar changed my perspective on what an important piece of the puzzle it was to my health. After that day I started paying close attention to the foods that I ate, how my gut reacted, how my digestion was and ultimately if excretion was “normal” after. After years on a Paleo diet post-Cholecystectomy, I’ve finally learned how to optimize my digestion. Most importantly, and what no doctor ever told me, is that it is with proper digestion that health and wellness is achieved. If you or someone you know has gallbladder disease or already has their gallbladder removed, Paleo is absolutely a wonderful approach for them. Since the basis of these recommendations goes against conventional wisdom and likely the opposite of what doctors are saying, let’s cover some Frequently Asked Questions. Q: My doctor says the Paleo diet is too high-fat to be gallbladder-friendly; he says I should go on a vegetarian diet. How can I possibly digest all the fat properly? A: First of all, the Paleo diet doesn’t have to be high-fat. There are plenty of paleo foods that are naturally low-fat. I ate chicken breasts, salads and steamed veggies my first few months I went Paleo out of fat-phobia. So, until you’re comfortable go ahead and do that. Chris Kresser also addressed this here. I think it’s easier to avoid sugar and get proper nutrients into you when eating fat, but you’ve got to figure that out yourself. When you’re ready, slowly add in the recommended fats from the Balanced Bites chart above and see how you feel. I found a proper carb-fat-protein ratio that’s ideal for my body; I know because my digestion is fantastic for the first time in years since having gallbladder issues! Second of all, I was a vegetarian for 7 years. This was the period of time directly before my gallbladder became diseased. My mother was also a vegetarian for nearly a decade, and it was during this time that her gallbladder was diseased. Interestingly, broth was one of the few foods we could eat without triggering painful attacks. Makes sense to us now that we know how great bone broth is for healing the gut! Q: You’re saying Cholelithiasis is a symptom of something else wrong, not the cause of health problems? What science backs this up? A: Here’s a link to the GallbladderAttack.com stating food allergies are a common cause of the disease.Here’s a link to Robb Wolf talking about how removal of the gallbladder leads to Dysphagia and other long-term health issues if the cause doesn’t get treated. Here’s a link to Robb Wolf talking about gallbladder removal and autoimmunity, and another about Celiac disease and gallbladders. And then this,this, and this out of PubMed. Q: When you say “digestive distress” what do you mean? What are some of the things that can happen after surgery? A: I mean loose, painful, and violent stools unable to be controlled (must-go-now) bowel movements. UsePractical Paleo’s “Poop Pageant” to see if your stools are “fatty” looking (malabsorption of fat) or less than ideal. This is what happened years after surgery; weeks after surgery the situation was so awful and uncontrollable that I (literally) didn’t leave the house for fear of not making it to the bathroom. Q: How can you reverse the inflammation and gallstones once you start to get them? Is that even possible? A: I have heard that it is. Since I found the Paleo diet and lifestyle after my gallbladder had already been removed, it’s never been something I looked into. However, several people commented on this postsaying that NDs can sometimes help with supplements. If it were me, I’d get plenty of sunshine and Vitamin D, get plenty of rest, gentle exercise and follow the 7 steps above. Q: What can I do if I’m still having issues with digestion? Is this going to be forever? A: Work with a professional! If you’ve done everything in this post and still are struggling, take the time, energy and money and invest it in what matters – your health. Someone like Liz Wolfe or Diana Rogers can help you determine what you might be missing in your approach that could be the key to solving your health issues. Undiagnosed Celiac Disease or other autoimmune conditions can have severe long-term health problems (cancer), so figuring out the issue and resolving it today is worth the investment it will take on your part. That’s what I did, and have been thankful ever since! Stacy Toth is the co-blogger at PaleoParents.com. She and her husband, Matt, lost over 200lbs adopting a paleo lifestyle. They have 3 young boys and blog about a practical and affordable approach to feeding their family real food. Their bestselling kid-friendly cookbook, Eat Like a Dinosaur, was published earlier this year. Stacy also co-hosts the well reviewed podcast,The Paleo View, and blogs about her emotional struggles and successes going paleo. You can find them on Facebook, Twitter, Pinterest and Instagram. Photos from WebMD, in accordance with the Use of Content policy. I just wanted to add some personal experience. Not only do I have no gallbladder, but I also have some degree of fat malabsorption due to a gastric bypass. In theory, I should not tolerate high fat foods well at all. But I find that I have no problem with the naturally-occurring fats in a Paleo diet. I do, however, have trouble with foods fried in vegetable oil or greasy fast food, etc. (which I avoid). Just my personal experience. I also have no gallbladder, and for years bought into the whole low-fat diet thing. Turns out I have no problem with eating a high fat Paleo diet, and lower carb actually works pretty well for me (I feel most energetic, even with working out, when doing the sugar detox). The only times I have a problem are when I accidentally ingest gluten (triggers the same severe pain I used to experience before gallbladder removal), dairy (even non-clarified butter sends me running for a bathroom), or vegetable/canola oils (running for the bathroom). My husband has the same gallbladder issues- gallbladder pain, told a few years ago he was a candidate for gallbladder removal. Since going Paleo, he’s had no pain at all. We’re both clearly gluten (and lactose) intolerant! I had my gallbladder removed three days ago, after several months of contemplation and research. It was not an easy decision, but I absolutely believe it was the right one. I found paleo after my food allergy diagnosis two years ago. (Yeast, dairy, avocados and coconut). My allergist – who has been preaching paleo since before it was a thing – firmly believes that my allergies are the root cause for 20 years of vague health complaints that were getting worse. My primary doc, obgyn and surgeon all back her up. I totally agree that my gallstones were the result of the damage inflicted on my body for years, and i find the autoimmune connection fascinating. Interestingly enough, though, it wasn’t until I went paleo that my gallstone symptoms started to show. 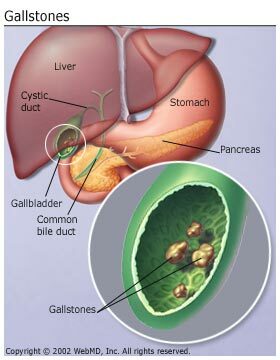 (Although it has been pointed out to me that many gallstone symptoms match my allergy symtpoms, so they were probably acting together for years.). When I was still having digestive distress and back pain after a month on the autoimmune protocol, I knew that there was nothing I could do with my lifestyle to reduce or improve my gallstone symptoms. (Every other symptom either dissapeared or significantly improved.) I have to also say that I never found enough proof to convince me that it was possible to reverse gallstone damage or get rid of them naturally – although certainly there are people who are lucky enough to live with them without symptoms. What I did find was a whole lot of people who have had really positive experiences following the surgery. My point is that while lifestyle changes and a paleo diet are of primary importance there are times when medical intervention/surgery is neccessary and I would hope people wouldn’t completely rule out that option just because it is given to them by the traditional medical establshment. Thank you so much for all your gallbladder posts. I had mine out 5 years ago because the pain was so bad I finally went to the Dr. and they found a gallstone and said my gallbladder had to come out soon (the next week). My pain is gone but I have digestive issues that I didn’t have with a gallbladder. I stumbled onto paleo after reading Wheat Belly and have learned a lot about not having a gallbladder. I can say eggs and bacon are fine but a chili with beans at work today was bad for me. No more grains for me. I love reading all the paleo blogs because they give me so much information about how to eat with no gallbladder and a thyroid condition too. Now my husband is entering a pale life too since his cholesterol is sky high. Thank you for the post. Having a missing gallbladder has been one of the biggest challenges with going paleo. I seem to have periods of time where my uncontrollable IBS flares up (makes it really embarrassing to try and go on a date involving a meal!) and others where it doesn’t. Sleep and stress seem to aggravate the problem. In the beginning, I couldn’t much fat at all… not even bacon fat or coconut oil. I know they are supposed to be “safe” for those of us with no gallbladder, but that wasn’t the case with me. Now, as long as my sleep and stress are in check, I can tolerate some coconut oil, coconut milk, bacon fat, but still use less than most recipes call for. I wish I could go ketogenic because I have a large amount of weight to continue to lose (and am addicted to carbs.. still) but I can not tolerate enough fat to make it work. Oh well… meats and veggies still have to be healthier than gluten (though I have had moments of extreme frustration with the uncontrollable bowels that I have went out and gotten a loaf of freshly baked bread… because I knew I could eat that without immediate distress). I wanted to share my experience in case anyone else is frustrated by not being able to consume even the “safe” fats. Give it time, it will eventually get better. Get the rest of your life (stress, play, sleep, exercise) in order, it helps! I’m still new to paleo (and without gallbladder) so I appreciate hearing any experiences from others that I can. I’m trying to figure out what I can handle, but you are right…all of those other things are important! And I know I need to work on getting enough sleep. Thanks for sharing! Thank you for this post! I’ve been eating paleo and I know fat is still causing issues for me (gallbladder removed over a year ago). I take a digestive enzyme with ox bile and HCL though sometimes it doesn’t help. It’s nice to have some guidelines to work with as there is very little information out there, in general, regarding eating without a gallbladder. So, thanks! What brand of digestive enzyme with ox bile and HCL do you recommend? I haven’t had a gallbladder since I was 24 & now 38 always have had some issues with diffrent foods but never realized it could be from my gallbladder. I had my gallbladder removed in 2002 at the age of 20 (hereditary – but I was WAY younger than anyone else in my family who had also had theirs removed!). My doctor did not do a good job of explaining to me what my life would be like after surgery… she never talked about food allergies or the discomfort I would now have after eating. Unfortunately, I had to learn the hard way, and became accustomed to eating bland foods, nothing fried or oily, and nothing that I “thought” would be too fatty. I didnt realize it, but it became my norm to feel sick, bloated and nauseous after eating – this was such a daily occurance, that I seriously just got used to it! About a year ago, I decided to go on a low-carb, high (lean) protein diet. After about a week of being on this form of a “diet” (lifestyle change), it dawned on me that I no longer felt sick after eating – I felt great! I had a lot of energy and felt “lighter” – not like I had lost weight lighter (even though I did), but not bloated lighter. Cutting out carbs was really hard at first, but it became a lot easier once I started following the Paleo diet! This is the first place I have even seen this topic discussed. I had my gallbladder removed 22 years ago. I have had IBS-like symptoms like many listed above for 15+ years that have gone undiagnosed. My doctors tested me for many things. I self-diagnosed myself with Bile Acid Malabsorption from reading on the internet. I had read that 60% of people who have their gallbladder removed experience this problem…but the doctors don’t tell you this. Mostly because they are unaware of it. The medicine used to treat the BAM worked sometimes for me…..finally…I started the GAPS diet which I have been on for 6 months (and now incorporate Paleo/Primal as well). I too still have occasional bouts of running to the bathroom, but only after eating too much fat. My life has totally changed in the last 6 months after eliminating grains and dairy. I am so happy to hear that others are being healed by the same way! I still have my gall bladder, but have an appointment with a surgeon next week! After reading this and a few other articles, I have realized that the new attacks coincide with the re-introduction of gluten into my diet. Would love to hear if others have eliminated gall bladder concerns via diet or other, more natural, remedies, so I am better prepared with questions and considerations for my appointment with the surgeon!! some of us neither have or want Facebook. Please don’t favor your Facebook followers over us. We now have a forum right here on the website. That response was over a year ago. Feel free to engage on the forum if you like. I was already hesitant about surgery as I know of others that have had the gall bladder removed and are still not always pain-free, which signifies other issues not resolved. Are the stones reversible? Anyone ever try the gall bladder flush…. I had my gallbladder in 1980, I think. Also did the low fat diet just like the rest of the USA, because we were told it was best for us. Since that time I developed colitis and have had it for 20 years and was also told I had type 2 diabetes the June 2013. Starting paleo in September 2013, doctor visit at the end of December showed no signs of diabetes and in February after an colonoscopy he found no signs of colitis. I laughed when I read what you said about the bathroom. Because that is what I told my daughter (that got me started on paleo) Now I know how normal people go to the bathroom. I agree whole hearted every thing you said. Thank you for posting, keep the info coming! Thanks for such a great article. I’ve had gallbladder problems for over 2 years now, but I think I’m finally getting back to normal now because my daily back pain has gone and my stomach discomfort is now fairly mild, and only occurs once or twice a day. In the last 18 months I’ve done about 25 gallbladder flushes, and in the last 4 months or so I’ve been taking Quebra Pedra, which seems to have made the biggest difference because it is said to dissolve gallstones. I had an ultrasound last year and I had ‘multiple large stones’ and in a scan last month I was found to have ‘a few small stones’. So I’m now fairly optimistic that I can hang on to my gallbladder and avoid surgery. Great, I will do that! I’m also signed up for the 21-Day Sugar Detox, looking forward to it, definitely need to remove that gluten again!! I had my gallbladder removed 16 years ago and have never, to my knowledge, had any digestive/elimination problems that couldn’t be explained [too many prunes…], never felt the need for any enzymes or other meds, and am not sensitive to any particular foods. I’ve always said that I must have a cast-iron stomach because I can eat anything and nothing causes me any IBS or anything like that. * So after reading these comments I’m reassured that not everyone has bad reactions. Anything else I need to know? *bragging aside, I started my first Whole 30 this morning and will try to pay attention to see if I uncover any sensitivities that I was unaware of. I have only just started the Paleo Diet, as In I have done it for 5 days now! I have suffered with Post Cholecystectomy Syndrome for 5 years. I have not had a normal non runny bowel movement for 5 years! I’ve done the medicines they offer, i’ve bulked up my fiber like they suggested at the doctors office and nothing worked. I couldn’t eat out with friends and family, I had to know where the bathroom was at every single store we went to. I have had to get up in the middle of meals to use the bathroom! Until 4 days ago. I have had normal bowel movements since starting this diet. I have had Bacon 3 days of the 5 in small amounts, 1-2 pieces as complements to my other foods. I can’t believe the dramatic change just in a short amount of time. Do I still have the need to go right away? yes however its not the horrible diarrhea I had chronically! the Freedom! I also have PCOS and I am hoping that switching my diet up will help me with this as well as helping me lose weight. I have lost 4lbs in 5 days just from changing up my diet and 30 minutes of cardio with light weight training. its amazing what happens when we take care of our bodies! :)Blessings to everyone here! This is all incredible information thank you for sharing. I was actually born without a gall bladder and have had stomach issues since I can remember, which finally resulted in horrible pancreatic attacks and a short stint in and out of the hospital. I’ve talked to doctors who either thought I was crazy or who were unable to give me a reason why I was in excruciating pain and a constant state of nausea. I finally just stopped going to the doctor and I’ve since been healthy, once I cut out fast food, trans-fats and other processed foods from my diet. After this last holiday season where I overindulged in over processed foods, I ended up having similar symptoms. Worried about getting sick again, I have been trying to eat “lean, green, and clean”. I feel better already. I’ve been nervous about even trying the Paleo diet as my doctor recommended a low-fat, vegetarian diet since I do not have a gall bladder. I’m a big runner and need to lift weights to keep my muscles strong enough to run, as such I want to fuel my body adequately. I have never felt energized unless I have meat protein in my diet and have never become a vegetarian despite doctor recommendations. All of this information has me re-thinking what my doctors previously told me and I plan on researching this further. I’m very curious about how an addition of ox bile might help me process food better. I just started doing the Primal/Paleo diet a couple of weeks ago and because i have been eating so much fat was concerned that without a gallblader my body would not be able to absorb the needed fats for my body to thrive off of. I eat alot of coconut oil which i have read does not need bile to digest since it goes into the blood stream but i also eat alot of omega-3 fats i want my body to absorb. Should i be taking bile salts with all my meals so that i know my body is getting the benefit from all the good fats my body needs? Or is my liver going to give me enough bile to absorb these fats? We talk a lot about how to improve natural digestive function on the podcast and I cover this in detail in my book, “Practical Paleo” in the digestion section. I suffered horrific Gall bladder attacks during my first pregnancy 34 years ago at the age of 20. As soon as my daughter was born the tests showed I had an enlarged gall bladder completely filled with stones and also 4 in the bile duct. (They thought i had to born with them) I had surgery when my baby was just a couple of weeks old. ( the kind where they still cut you almost in two) I have had thyroid issues since during this time also. I have every symptom of thyroid disease, gluten intolerance, chronic fatigue syndrome, and finally migraines. My neurologist suggested I had food allergies. So far nightshades, pineapple, Parmesan cheese, raisins, I’m sure they are more also. So far paleo is helping, but still have excess weight, digestive and energy problems. So I still need to eliminate until I can find what works for me. We now have a community right here on the website. That reaction was over a year ago. You can interact with on the community if you like. I am so relieved to read this and see everyone’s different responses and ways to deal with no gallbladder in their lives! I actually struggle with constipation, mood swings which I think is due to eatin way too little carbs. I follow about 90% Paleo and would like some guidance on how anyone deals with the issue I experience. Thanks! We recommend a paleo diet to our clients. We deal a lot with gallbladder and liver problems and diet is key. This is and or a vegetarian diet is key in alleviating gallbladder issues. The only thing I would add to that is that meats need to be hormone free as this can cause gallbladder and liver issues in the long run. Wow! You just told my life story, except I had my gallbladder out twenty years ago. I’ve been diagnosed with Candida, IBS, and a bad case of diarrhea-causing anxiety, but no doctor has ever acknowledged a cause to the gallstones or even that removing the gallbladder made my diarrhea worse. I just started the paleo diet and it has helped the diarrhea (so far), high fat and all. But the color of my stools had me concerned enough to do a search today. Non-paleo websites said the pale/green color is a liver problem so I search paleo to see if this is a common occurrence after starting the diet. So far, no hits on the green. I have an appointment Tuesday with a gastroenterologist on Tuesday to schedule a colonoscopy and I was wondering how much to tell him. My semi-annual blood tests with my internist have shown my Vit B levels consistently low even though I take a Calcium with B and a B12 supplement every day. My guess is that I am just not getting the nutrients I need because of the constant diarrhea. I just ordered Practical Paleo and plan on starting the elimination diet as soon as I get it, and will find some of those digestive enzymes also. Thank you for your testimonial. It encouraged me enormously. Are you taking methylated B vitamins? There are certain genotypes that can’t absorb B vitamins unless they are in the methylated form. I have that genotype; easily discoverable with the right test. A naturopath might be able to run it for you. Can you link to where I can find a forum on this topic on the page. We no longer offer a forum. Great article! I hope you don’t mind me posting that I recently published a book, Living Well Without a Gallbladder: A Guide to Postcholecystectomy Syndrome. It may be helpful for your readers. It’s available through most online booksellers and is in paperback and ebook formats. I loved what you wrote here! I suffered for 13 years misdiagnosed with various ailments–psychological and physical. Turned out my pain and nausea were all from having my gallbladder removed! This organ isn’t like the appendix. It actually does a lot for our body. Diet goes a long way and patients need to be mindful of not overeating, which puts stress on the organs especially with no gallbladder. I too had my gall bladder removed about 38yrs ago. Unlike most of you I didn’t get the loose bowl motions but constipation instead, I have been a regular user of Senna. I was in my 20s and there was very little information apart from don’t eat too much cheese. I have suffered from IBS (the medication began for me the weight issues). I still reacted horribly to certain foods to the extent of having morphine (eggs, cream, high fat foods). The yoyo dieting and over exercising has gone on for years. With the excess weight came the high blood pressure and high cholesterol. Cholesterol tablets made me ache all over so it was back on the weight loss and exercise regime to bring my body down to a healthy range. Ran my first half marathon November 2017 but I struggle daily to control my eating to the extent that I count every calorie I eat. About 8 weeks ago I was introduced to Keto eating and to be honest I haven’t found it that hard to follow. This is where I came across and article by Dr.Jockers.com – Following the Keto Diet with out a Gallbladder. Great explanation and especially how the body no longer can absorb food and some very good suggestions and advice. One is that I should increase my carbs a little more which on Keto you try to keep low and also about the good high fats and good medium fats. This is why I started looking at Paleo and found this page with some also very good advice. The thing is it has taken me all these years to find an answer to my health issues and with a few tweaks hopefully my liver will be able to heal and function a lot better and I won’t have to exercise so intensely although I’ll keep the running up and hopefully now I’ll be less fatigued. Thank you Keto and Paleo people there is hope even at 63yrs.